Manufactured Stone is a cement and lightweight sand/gravel mixture usually wet cast and vibrated in rubber-like molds. The molds were made by being cast from real stone and reproduce the texture and shape of the real stone pieces. Before the wet mixture is poured into the mold, the mold has iron oxide color treatments applied that are then absorbed into the concrete mixture to create a face that looks like the real stone. These pieces of manufactured stone are so like the natural stone that when installed it is very difficult to tell they are not natural. Nonetheless, this is treated as a concrete product and not as stone. Manufactured stone is a concrete product, and like all concrete products will lighten in color over 2 or more years. This is not fading. It is low level "efflorescence" (slight mineral deposits in the pores) and you can see how to restore the color efflorescence here. Manufactured stone costs less per square foot than real stone. However, now stone companies are cutting natural stone into thin veneer pieces and that is bringing the pricing closer together. If you have a cut natural stone, see the page for that stone. 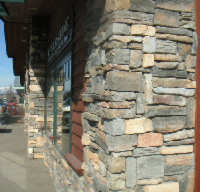 Manufactured stone costs less to install than real stone, and should be close to cut stone costs. With quality manufactured stone, it takes an expert to tell it from natural stone. Very difficult to tell from natural stone. The question we answer for you here is how to make it as durable as natural stone. That is, to strengthen the face & retard fading. Also, as concrete will etch in contact with acidic liquids, another goal is to protect manufactured stone from acid attack. The stone is usually installed from the top down so that as the mortar is tooled, it drops down without landing on any of the stone. That is because the mortar can stain the stone and the typical muriatic acid cleaners cannot be used without risk of etching the colored cement stone face. If top down installation is not working - do not use a sealer as a grout barrier ((pre-seal. Prevent grout smears, surface scratching and keep grout residue out of surface texture by coating with Aldon "Grout Easy" before grouting. "Grout Easy" is a water soluble coating that comes off easily while grout is being cleaned up with water and a sponge. You would not normally use acid based cleaners on cement products because of the risk of etching and bleaching. Any removal of mortar stains should be done with Grout Residue Remover. Efflorescence (subsurface originating white powdery stains) can occur on this concrete product and the mortar. This can appear even before installation. However, it is easily cleaned. Colors can "fade" in this concrete product . The appearance of fading is actually from light efflorescence particles in the pores. The colors can be restored, then the efflorescence can be stopped from returning by sealing with the appropriate Aldon sealer. The products you may need for surface Preparation before sealing. Pictures of each of the recommended sealers for this surface type. Click the sealer's picture for it's full description. Handy tips to prevent issues that others have had before coming to Aldon. Perhaps more information than you need now, but might be of interest later. You have 1 of the 3 possible situations that follow. The products you need are listed in the sequence that you would use them. Click the picture to add a product to your list. * Should not be needed after using Grout Easy. #2. If the Manufactured Stone is installed but is not sealed. * If you have old grout smears. ** If you have white powder (efflorescence) stains. *** If your grout is badly stained. #3. If the Manufactured Stone has been sealed in the past. * If, after stripping, you find old grout smears or crystal efflorescence from years ago. ** If your stone is badly stained. Regular stains are usually removed by the stripping process. This is an absorbent material. Therefore, it can stain. Some of the manufacturers of this type concrete product have their sales people make recommendations that may not be to your benefit. Some have a sealer made for them and therefore are motivated to sell you that sealer that may not be your best choice. Evaluate what Aldon has to say about sealing then decide which makes you the most comfortable. Other sales people say their manufactured stone should not be sealed. This is because they don't know enough about sealers and are justifiably concerned about problems. Simple logic says - if a material will darken underneath a water drop, then water is absorbing. If water can absorb, so can a stain. Therefore, it should be sealed. Most people have no idea about the history and characteristics of their flooring. You can click this link to see how to easily test with water drops and understand which sealer is most appropriate for your goals.
. Was it sealed in the past? Does that matter?
. Will a new sealer be compatible with whatever was used before?
. What Aldon sealer will give the visual results you want? "Same Day Sealer" on Manufactured Stone. This sealer is Water Base | Penetrating Type. Provides: No color enhancement or gloss. Coverage guidelines (depending on absorption) 250 to 600 sq.ft./gal. "Same Day Sealer" is typically the choice because it does not have any effect on color or create any gloss. And, it is easily sprayed on walls. 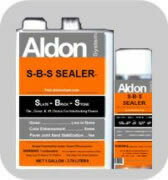 "S-B-S Sealer" on Manufactured Stone. This sealer is | Solvent Base | Penetrating Type. Provides: color enhancement | low gloss | strengthening | efflorescence barrier. Coverage guidelines (depending on absorption) 150 to 500 sq.ft./gal. S-B-S Sealer is a low solids sealer that creates some color enhancement and an easier to clean surface. Usually, manufactured stone is so absorbent that no gloss is created. The color enhancing effect of S-B-S Sealer can bring back original colors. The aerosol makes doing back splashes, showers, and other small projects easy. Easy Care Products: for a Manufactured Stone floor or wall. "Insta-Clean" removes food, grease, oil, etc. stain causing materials - from floors, patio furniture, machinery. "Maintain" - for no streak wet mopping of Manufactured Stone and all other types of flooring. "Lifeguard" prevents traffic wear to a sealer. Adds gloss. "Dust Whiz" - easy dry mop dust pickup at 1,000 sq. ft. in 3 minutes. You may have heard of concerns about Manufactured Stones. All of them would be prevented with the information we provide here. Therefore, you can have the floor you want! To select a sealer it is good to have some idea of the absorption rate so you achieve the gloss level (none to high) and all the other benefits available without using more sealer than necessary. Also, you can test for (and protect against) acidic liquid sensitivity. An Aldon sealer does far more than just bead water and look pretty! To see what that is click here. Your results may vary somewhat from these pictures due to variations in computer display and the surface materials themselves. Nevertheless, you will be able to see the differences well enough to make good choices. Important: If your project has had any sealer applied in the past, it must be evaluated differently. To see why, Click here! This discussion applies only to the petroleum solvent based sealers. With the water based sealers, solids level is not a consideration. A porous surface will require more gallons (more money) of a lower solids sealer than using a higher solids level sealer. That, plus different surfaces have different requirements, is why we make the different solids levels. They all work as described, so it is only a matter of which is best for your needs. The more porous the surface, the more solids will be required to achieve the desired effects of gloss, strengthening, stopping efflorescence, etc. The more porous the surface, generally the greater the need for the sealer to create a stronger surface. An old sealer below the surface, even after stripping, will lower the absorption and porosity to some degree. Sometimes it is uneven below the surface and can create an uneven coloring effect with a color enhancing sealer applied later. Another reason to test first. Do not make decisions based only upon the price per gallon. Unlike other sealers, Aldon's sealers typically require fewer applications (fewer gallons), less cure time, and longer life. And that is only a few of many considerations. To see more of why the price per gallon has little to do with what will be your total project cost, click here. For other questions about sealers, see the FAQ Sealers link on the slide out menu. There is no need for confusion or problems brought about by misidentification of a surface type, yet it happens all too often. Sellers use fancy marketing names that can be misleading about the true nature of a surfacing. For instance, a customer was told they bought "Petite Granite" for a bar surface. But, unlike granite it was etching circles from wine drips. After simple testing, it proved to be a limestone which is treated very differently than granite. It was easily restored and protected after a 60 second test. Please review our "Surface Types" page to compare pictures, descriptions, and testing if needed, to confirm you have what you were told. Do not "pre-seal" - apply a sealer BEFORE grouting. Do not use any sealer as a grout release barrier (pre-sealing). This technique creates many risk factors to be avoided. Prevent grout smears, surface scratching and keep grout residue out of surface texture by coating with Aldon Grout Easy before grouting. Grout Easy is a water soluble coating that comes off easily while grout is being cleaned off in the normal process with water and a sponge. The iron oxide pigments used in concrete products, and the colored clays in clay products, do not fade . The appearance of fading is actually from tiny efflorescence particles (white powder) in the pores. It can be removed and color restored (with Aldon Efflorescence Treatment) and then stopped from returning, and color restored, by sealing with the appropriate Aldon penetrating type sealer. Efflorescence (subsurface originating white powdery stains) is common with many surfaces. This can even occur before installation. However, it is easily made to disappear without scrubbing by using Aldon Efflorescence Treatment. If the white powder is old and is now "crystalline" that is bonded to the surface - it can be eaten away with Aldon Grout Residue Remover. 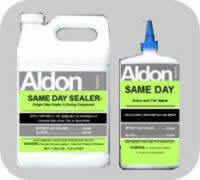 Aldon Sealer applications can be made hours or years later, but do not apply thin layer upon thin layer. Apply a sufficient quantity to insure below surface penetration & bonding. Or, for the solvent based penetrating sealers, test spraying lacquer thinner as an alternative to slightly melt and reform the surface and not build too much gloss or create sealer "layering". A layer of sealer on top of another layer of sealer can result in poor bonding between layers and that can cause separation peeling that looks grayish. Concerned about Doing It Yourself or what your contractor says? If you are concerned about doing it yourself - consider that the satisfaction of a project is directly related to YOUR knowledge of what needs to be done and how. Who actually does the work is less important. We estimate that 50% of the usage of Aldon products is by "do it yourself" homeowners and we know they are happy because we hear from them. Our goal for our contractor customers - NO CALL BACKS. A good contractor will understand the logic of Aldon application instructions on the labels and will not take shortcuts. If a contractor does not agree, feel free to let us find out what is so unusual about this particular project so the contractor does not have to return.